Group 9, numbered by IUPAC nomenclature, is a group of chemical element in the periodic table. 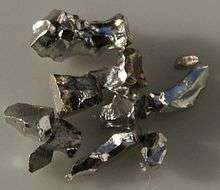 Members are cobalt (Co), rhodium (Rh), iridium (Ir) and perhaps also the chemically uncharacterized meitnerium (Mt). These are all transition metals in the d-block. All known isotopes of meitnerium are radioactive with short half-lives, and it is not known to occur in nature; only minute quantities have been synthesized in laboratories. Meitnerium has not been isolated in pure form, and its properties have not been conclusively observed; only cobalt, rhodium, and iridium have had their properties experimentally confirmed. All three elements are typical silvery-white transition metals, hard, and have high melting and boiling points. Cobalt has been discovered in Egyptian and Persian artifacts from before the 2nd millennium BCE. Rhodium was discovered in 1803 when William Hyde Wollaston dissolved platinum ore in aqua regia, then neutralized the acid with sodium hydroxide. Wollaston then added ammonium chloride, and dissolved all metals except rhodium and palladium with the nitric acid in the aqua regia. Iridium was discovered in a very similar way in 1804 by Smithson Tennant. Meitnerium was discovered in 1982 by bombarding bismuth-209 with iron-58. All group 9 elements are relatively rare in the earth's crust, with the most abundant, cobalt, only accounting for 0.0029% of the Earth's crust. Rhodium and iridium are two of the rarest naturally occurring elements in the earth, only found in platinum ores. Meitnerium has only been produced in nuclear reactors and has never been observed in nature nor isolated in pure form. Cobalt is an essential trace nutrient to all animals, found in vitamin B-12. Rhodium, iridium, and meitnerium have no known biological roles.